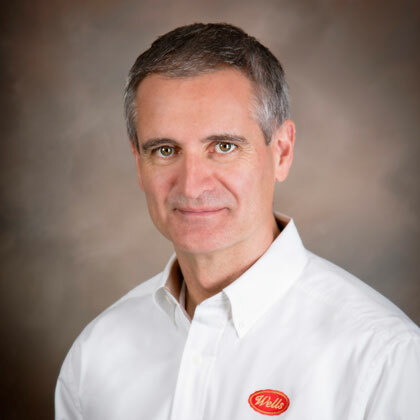 Liam Killeen joined the Wells team in April, 2014 as Chief Operating Officer, bringing close to 30 years of experience in the consumer packaged goods field having worked in the confectionary industry. He is an award-winning marketer and visionary leader with high-caliber cross-functional management qualifications in sales, marketing and operations business management. Killeen joined Wells from Ferrara Candy Company/ Farley’s & Sathers, Inc., a confectionary company with well-known brands including Brach’s, Chuckles, Lemonheads, Jujyfruit, and Red Hots. Killeen served as Chairman, CEO & President of Farley’s & Sathers, Inc. and worked for a privately owned confectionary company, Storck KG, (maker of Werther’s Original candies) serving as CEO for North and South America as well as Great Britain. Earlier in his career, Killeen’s experience was developed in CPG marketing with confectionary companies such as Brach’s and Jacobs Suchard, AG (maker of Toblerone) of Zurich Switzerland and with Van Melle USA, Inc. (maker of Mentos) as the VP of Marketing.Killeen received his Bachelor of Commerce from the University College Cork in Ireland. Liam’s favorite Blue Bunny treat is a scoop of Premium Chocolate ice cream.